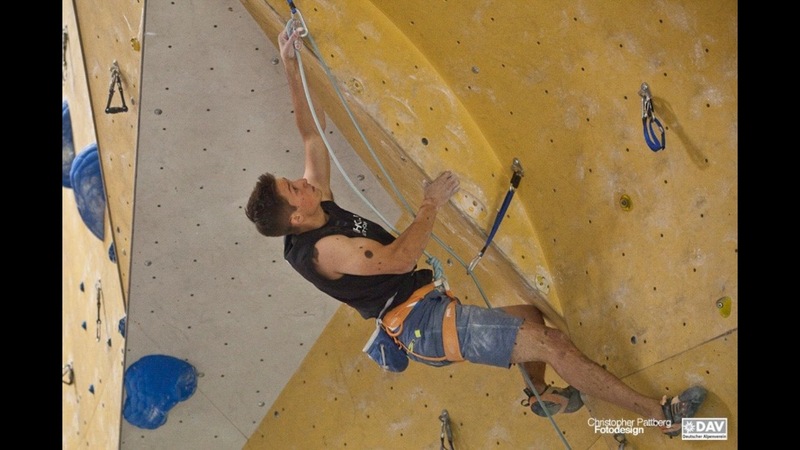 The last stage of the German Lead Championships took place at Neu-Ulm (Bavaria) last Sunday. 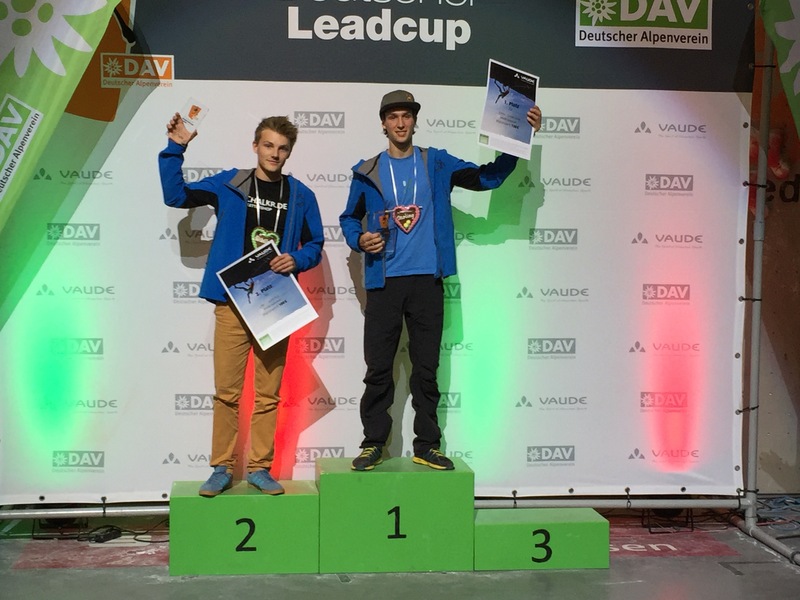 As last year, this year’s championships consisted of 3 competitions, in Germany known as German Lead Cups. 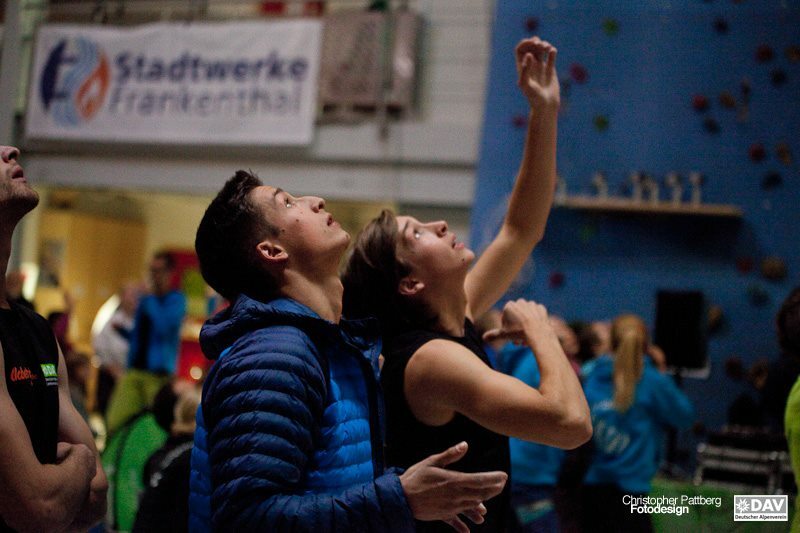 The first cup was hosted at the brand new DAV climbing gym at Munich Freiman and the second at a rather old but gold climbing gym at Frankenthal in Pfalz close to Mannheim. For us two it was a nice series with various challenges because the Cups had different route settings. We’ve never been to the new gym at Freiman yet so we didn’t have any idea how the wall with its structures and angles would be like. In addition, it was outdoors but luckily it wasn’t that autumnal like now. Usually artificial holds get more slippery when cold. The qualification routes were sustained and demanding. Ruben easily qualified for finals and David nearly missed it with an 8th place. The final was well set but could have been a bit harder. Jan Hojer and David fell at the last move to the top but Jan won due to better results in the qualifications. Ruben finished 1st in the juniors ranking and 5th in the men’s category. He definitely could have done better but he hesitated while clipping and lost power and flow. Frankenthal is a steep and powerful wall and the 2nd cup was set in a very dynamic style with at least one jump in almost every route. The qualifications went well and we both qualified for finals as 3rd and 4th. Unfortunately, the final route was very unsustained. It was maybe an 7c+ climb until a huge jump to the left where almost every finalist fell except Jan who fell two moves later. It is always a pity when one move spits off more or less every athlete so that the pre-round counts for a final result. However, we were close on the jump (David made a foot mistake and Ruben got stuck with his hand in the rope while jumping) and definitely able to stick it so it’s hard to complain. Ruben finished 1st in the juniors again and 3rd in the men’s event which was one of his best results so far. David missed the podium as 4th place which made him a bit frustrated. Last weekend turned out to be kind of a speed final in a lead final route. The qualification round saw a bunch of double tops with a tricky slab. Regrettably, Ruben fell too early in the first qualification route and got a time-out in the slab. He couldn’t make finals with a 12th place but nevertheless he won the juniors game and therewith became German juniors lead champion winning 3 out of 3 events. And that was also enough to save a 5th place in the seniors championship overall. Pretty good season for him this year! Sebastian Halenke was the first to top the final route. And since Jan Hojer, Chris Hanke and David also topped it, it was all about time to secure the victory of the day. David, being the last one to come out of the Isolation zone, actually had the most pressure but eventually it was a tactical advantage because he knew from backstage that the route must be doable and that he had to climb fast. In the end he clipped the anchor by 15 seconds slower than Jan who was literally running up the wall without taking a single rest. A 2nd place in the day ranking assured David of the vice title in the championship behind Jan which was tactically the priority because Jan more or less secured the title already by qualifying for the final. 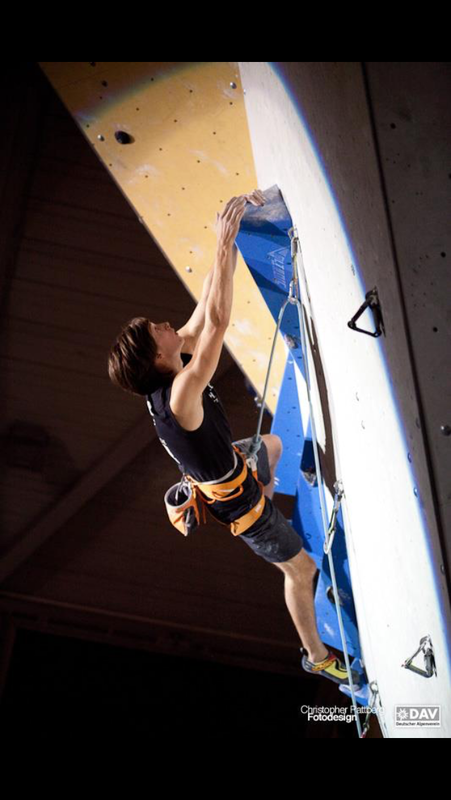 Props to him for a strong performance on all three events and especially to our team mate Lena Herrmann who became German lead champion after a break of competition climbing and some 8c’s on the rocks lately! In our opinion this year there hasn’t been a superior route setting. We would like to have harder routes, especially in the finals. Predominantly, we climbed at a grade of 8a+ but we actually need final routes at a level of 8b+ to be hard enough to separate the finalists. And it shouldn’t come down to only one move which spits the majority off like in Frankenthal or too many double tops even in the finals like in Neu-Ulm. More sustained and harder routes would add value to the events! And this is what awaits the athletes in the world cups. Young talents start training the characteristics of the routes in the lead nationals but this won’t prepare them to be successful in the world cups later. We would also appreciate a strong field of competitors next season again. Especially in Neu-Ulm it was nice to see the whole German lead team and the strongest competition boulderers of the country. But athletes must have great reasons to come and compete at the nationals. So far there hasn’t really been an attractive amount of prize money and we think it’s time to raise it. It’s not an economic and rational choise as a competitor to spend hundreds of euros for the travel and the accommodation and to spend a whole weekend of time to maybe collect some prize money in the end to not fully be able, even as a finalist, to re-finance the effort. If nothing changes it is only a matter of time that the cups become less and less attractive for the strongest athletes to come. We also would like to get rid of all the waiting times during the competitions, particularly when the youth events get integrated into the seniors’ competition. Please, let us seniors compete on Saturday and in a shorter time. Qualification can be done at around midday and finals in the early evening without a long break of several hours in between the rounds. That requires a tight timetable but it’s definitely possible to organize that. This is also more attractive for the spectators because if they would have to watch finals on Sunday night they would overthink it twice because they have to start work on Monday again. If the finals would be on Saturday night that would have a day in between. And based on a tight schedule they wouldn’t have to stay a whole day in the gym waiting most of the time. And finally, meanwhile we know a lot of competitors and their teams, parents and relatives who support them during the competitions. We don’t see so many new faces though. Especially random spectators. It is only a small group of insiders who actually visit and watch the competitions but we think the competition format can be entertaining for a wider range of people. It would be nice to see working live streams and better advertisements in prior for the competitions to reach more people. From our point of view the DAV (German Climbing Federation) should invest more effort into their event marketing and promotion. That’s it for this year’s competition climbing. We are already looking forward to the next season. Now we are already in Catalonia for some off-season rock climbing. We’ve got some great projects that we want to work on and it’s always nice to see the big rock climbers’ family from all around the world at the crags again. It always means great climbing together and good vibes. We are excited and keep You updated with our climbing experiences there. Find the whole result list of the juniors and the seniors German Lead Championship via the links! 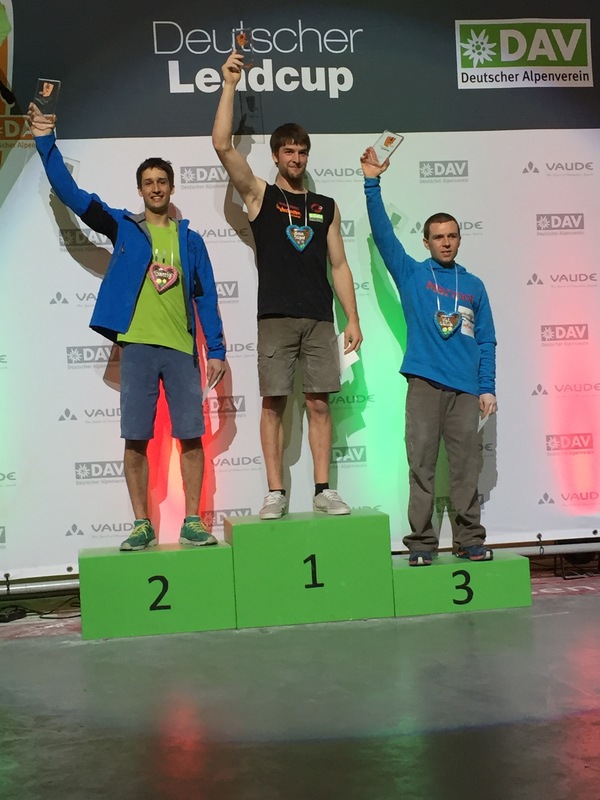 Dieser Eintrag wurde veröffentlicht in Allgemein und verschlagwortet mit bavaria, champion, champions, climbing, competition, dav, david firnenburg, deutsche lead meisterschaft, deutscher leadcup 2015, dlc, escaladrome, firnenburg, firnenburgbrothers, frankenthal, german champion, german lead championship, german lead cups, germany, gym, haglöfs, jan hojer, Klettern, lars hoffmann, lead, lena herrmann, martin tekles, münchen freiman, munich, Neu-Ulm, paul hettich, petzl, pfalz, results, ruben firnenburg, scarpa, sport champions, wall, wettkampf von admin. Permanenter Link zum Eintrag.